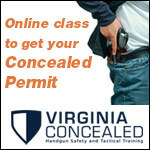 Should Training Be A Requirement For Carrying Concealed? The Bra Holster: Is It A Viable Option For Women? Not everyone likes the same handgun. 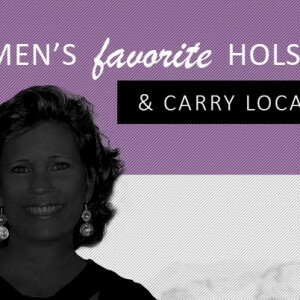 We’re all different, which is why not every woman prefers the same type of holster, either. 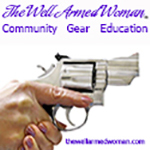 IWB is the most popular choice for most women, followed by the belly band, for on-body carry. Then, there’s the bra holster. I have never owned a bra holster, until this past week. I wanted to do a new video on all the different options women have for holstering, so I needed to add this little gem to my ensemble. 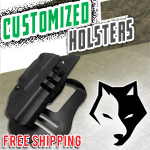 I ordered a Flashbang holster for the Ruger LCR, as this is a popular firearm choice for many women. Well, the cuteness factor was certainly present when it arrived – nice logo, attractive presentation and three optional bands made of a high quality suede, in addition to the Kydex clamshell. Like a good female brain, I read all the instructions first. Then I read the instructions again while I attempted to attach the device. I struggled. I struggled terribly. I reread the directions. I watched a video. I still couldn’t get it to work well and look as sleek and cool as the lady in the video. The snap was very difficult to get snapped and unsnapped, which in actuality, is probably a good thing. Thinking that that was just clearly the wrong bra, I changed into an underwire bra and tried again. This was a much better solution. The holster was much more secure on a firmer bra. I wore it from the late afternoon into the late night. Ow. Now, I’m not exactly large busted, (keep it to a low roar, please) and on the thin side, and I guess that was a big reason that this holster was just plain uncomfortable. It rubbed against my sternum and ribs, and it looked like there was a tumor on my chest, even though I had it positioned correctly. I’m guessing that if I had on an empire-waist blouse, that may not be the case. I was wearing a zipped hoodie. I first placed the firearm in the holster from a vertical position. I actually pinched my skin doing this! I got caught somehow in the clamshell – damn it! 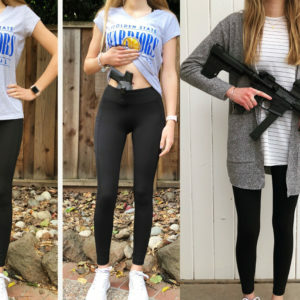 After I watched the video, the nice lady shows to hold the holster horizontally and re-holster – that would have been nice to have in the written directions as well. I will add, after placing the firearm into the clamshell, on one occasion, I did not get the entire firearm correctly placed. I heard it click, so I thought I was good to go. I went into the bathroom to look in the mirror to see how it looked (and take a picture), and I noticed that not all of the trigger guard was covered. After I wiggled it a little further, it did get covered completely. So, be sure to check this if you are a new user as well. Just because it sounds like it worked, it may not have. The clamshell is a neat device. 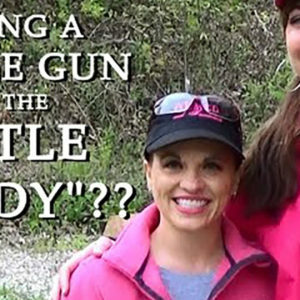 It’s molded for each individual firearm and it does fit snugly, but it smashed my breast. Drawing was easy, but I could not easily get my thumb around the grip of the gun. If I tried to use my thumb, the draw was slow and awkward. I was able to just use my palm and fingers, with my thumb in the “up” position, and it drew just as nicely – and more quickly. 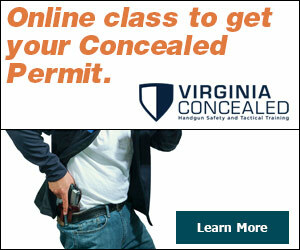 I didn’t mind, because as soon as the firearm was out, my thumb naturally assumed its rightful position on the grip. So, in order to give this a fair shake, I had my “bustier” and curvier friend wear this holster with the firearm for a few hours the next day. We giggled and struggled getting it onto her bra as well. Her bra was a wider band with underwire, and after we got it placed and snapped (the real struggle) it looked great! She wore it for just over two hours then came to me with a sad face and said “can I take this off now?” Her activity was office work. She sat and worked on the computer a while and got up and walked around the office a bit, so nothing strenuous. She remarked that it made her sweat, moved out of place and slid a bit. It was also visible through the shirt she was wearing. So in rating the holster bra, the retention in the clamshell is great. Once you master the suede bands, it can be retained nicely on the CORRECT bra. This will in no way be functional on a little, lacy Saturday night special bra. Accessibility was fine with a minor adaptation. It was not very concealable nor did I find it to be comfortable. However, some of this is probably due to my scrawny frame. The bra holster is the cauliflower of holsters. You either love them or hate them.